shin-ei Honey baby cry fuzz Model Fuzz Effect (1968), made in Japan, Black finish. One of the most deranged and unholy fuzz pedals we have ever played. Made by the noteworthy Shin-ei company in the late '60s. 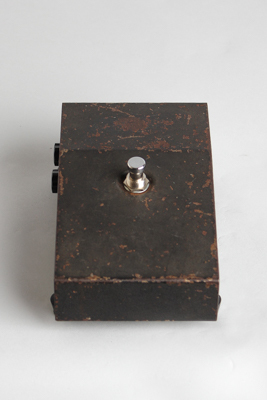 Has a volume and gain knob, as well as a tone switch. One tone is darker and heavier, and the other is quite bright. The more interesting aspect is that the sustain seems to be naturally gated. Overall the case is worn, with some dings and dents. Structurally sound. There is some faded Japanese writing on the bottom of the pedal. Very Good Condition.